Artist's concept of NASA's New Horizons spacecraft flying through the Pluto system in July 2015. NASA's New Horizons spacecraft will be ready for its epic Pluto flyby next week despite a recent glitch, mission team members say. 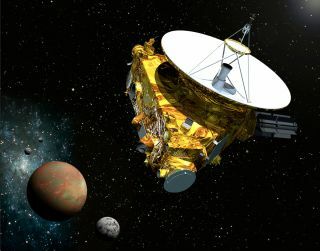 New Horizons went into a precautionary "safe mode" on Saturday (July 4) after experiencing an anomaly, but the problem did not turn out to be serious. New Horizons' handlers say the probe should be back to normal science operations by Tuesday (July 7), exactly one week before it performs the first-ever flyby of Pluto. "The investigation into the anomaly that caused New Horizons to enter 'safe mode' on July 4 has concluded that no hardware or software fault occurred on the spacecraft," mission team members wrote in an update Sunday (July 5). "The underlying cause of the incident was a hard-to-detect timing flaw in the spacecraft command sequence that occurred during an operation to prepare for the close flyby. No similar operations are planned for the remainder of the Pluto encounter." If New Horizons does indeed bounce back fully as planned on Tuesday, the glitch's effect on the mission's science return will be miminal, team members said. "In terms of science, it won't change an A-plus even into an A," New Horizons principal investigator Alan Stern, of the Southwest Research Institute in Boulder, Colorado, said in the update. On July 14, New Horizons will zoom within 7,800 miles (12,500 kilometers) of Pluto, capturing the first up-close looks at the mysterious dwarf planet. During closest approach, the spacecraft should be able to resolve features as small as the ponds in New York City's Central Park, mission officials have said. "I'm pleased that our mission team quickly identified the problem and assured the health of the spacecraft," Jim Green, director of NASA's Planetary Science division, said in the update. "Now, with Pluto in our sights, we're on the verge of returning to normal operations and going for the gold." The $700 million New Horizons mission launched in January 2006 and is now nearly 3 billion miles (4.8 billion km) from Earth.